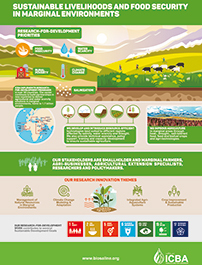 Sustainable livelihoods and food security in marginal environments. What are marginal environments & why should we worry about them? © 2019 by International Center for Biosaline Agriculture (ICBA). Except where otherwise noted, content on this website is licensed under a Creative Commons Attribution-NonCommercial 4.0 International License.